As cold weather moves in, it is timely to remember the deadly danger of antifreeze to cats. Less than a teaspoon of antifreeze – even a curious lick from a small driveway spillage – could be enough to cause potentially fatal poisoning in cats. Cats are particularly susceptible to poisoning from antifreeze due to their specialised metabolism. When ingested, a small amount of antifreeze can cause rapid and fatal injury to a cat’s kidneys. Clean up any spills immediately, no matter how small. Never add antifreeze to garden water features or ponds – cats drink this water. Keep antifreeze in clearly labelled, sealed containers, away from pets and their environment. Dispose of antifreeze safely and responsibly. Cats Protection campaigns rigorously for antifreeze and other products containing ethanol glycol to clearly warn of the danger to pets. But tackling antifreeze poisoning is not easy. Most antifreeze products in the UK contain ethanol glycol but labelling is insufficient. While product labels should warn of the danger to children, there is no obligation for companies to add a warning of danger to animals too. Unfortunately, some people think that the addition of bittering agents in antifreeze means that the product is ‘safe’. But seeing a bittering agent listed on an antifreeze label may give pet owner the false impression that the product is safe. Cats Protection is not aware of any tests having been carried out to determine the effectiveness of bittering agents as a deterrent to cats, particularly as it takes so little antifreeze to be fatal. Obviously, we would not support testing on cats. Bittering agents are NOT the answer, or at least not the whole answer. 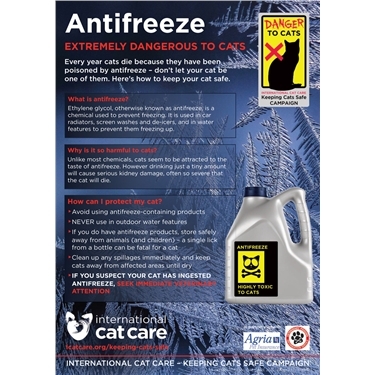 Cats Protection is calling on antifreeze manufacturers to develop alternative non-toxic antifreeze products. In the absence of legislation or official guidelines, powers rests with consumers and their choice of purchase. Download an antifreeze warning poster from International Cat Care here.